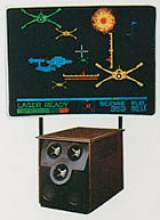 Video Moon Tracker © 1980 Nichibutsu. Video projector model. See the standard Upright model entry for more information about the game itself; "Moon Tracker [Model MTA-5001]".